Glasgow is set to host the world’s first exhibition celebrating the creativity and social impact of street papers worldwide. Launching as part of INSP (International Network of Street Papers) #VendorWeek 2017, the exhibition – UNCOVERED: still homeless, still an issue – will be the first time that audiences have had the opportunity to explore the outstanding design of street papers and the story behind the global street paper movement. 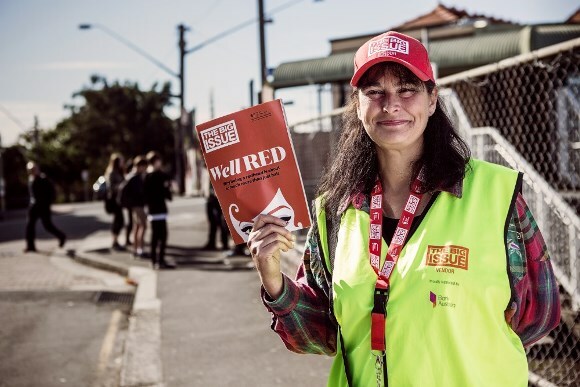 The Big Issue Australia vendor Rachel Maree Aldam, Chief Executive of INSP said: “At INSP we are wowed by the creativity of street papers on a daily basis. This unique exhibition is an opportunity for everyone to share that feeling. The free interactive exhibition starts with a launch event on the evening of Thursday, 9 February and will be open to the public from 10 February – 9 April at The Lighthouse in Glasgow. While The Big Issue is well known throughout the UK, many people are unaware that there are 110 papers in 35 countries that use the same model to offer ‘a hand-up, not a hand out’ to people facing homelessness and social exclusion. The Big Issue UK vendor Serban sells the magazine in Glasgow. Photo: Andy Buchanan Glasgow is at the heart of this network, as the home of INSP – the network organisation that brings these papers together, offering support, advice and resources. INSP created the exhibition in partnership with top ideas agency Equator. Their Chief Creative Officer and co-founder, James Jefferson, said that he was happy to be able to shine a light on the great work of street papers. Mi Valedor vendor Francisco “This exhibition is an amazing way to highlight an issue that’s right on our doorstep. Homelessness is unfortunately still an issue in 2017,” he said. “Glasgow has been at the heart of the global street paper movement and we’re proud at Equator to be a part of that. We wanted to hero the vendors that sell these street papers from all over the world and provide them the recognition they deserve, but in a way that allows visitors to understand what goes into not only selling each issue, but producing them too. StreetWise vendor Lee Scotland’s Centre for Design and Architecture, The Lighthouse, is offering its support to INSP by hosting the exhibition. #VendorWeek is INSP’s annual, global celebration of the 10,000 men and women who are currently selling street papers.